Under Rich Earth is a cheaply made film that opens with an apology for the quality of its footage. But the story it tells so satisfying you probably won’t even notice. Already you can see where this is going — local indigenous people fighting multinational business interests. What you may not predict are the dirty tricks the Canadian company and its affiliates are willing to try, and the success the locals achieve. The documentary builds. At first there are minor conflicts in the press and in the political sphere. Press releases lead to protests which lead to lawsuits and police actions. Under Rich Earth makes emotional appeals against the mining company, which always makes my skeptic sense tingle. Emotional appeals are important, but if a documentary can’t refute facts, figures, and conclusions, I feel I’m being taken advantage of. I would have liked to play devil’s advocate. For example, the mining company’s representative in Quito repeats a figure of “85% support” for the mine. The locals in Junin laugh that off as absurd. But as an outsider I’d have liked to see that number investigated — where did it come from, how was the survey worded, how local was the sample population? I’m guessing the company would come off looking even worse for being unable to defend its favorite number under scrutiny. But maybe it would have shown a genuine controversy on the ground that the filmmakers chose not to investigate. But before the idea of devil’s advocate can fully form in my head, the movie shows us just how dirty the mine’s local representatives are willing to play, and they lose all credibility. (Spoilers ahead.) It gets so bad that scores of armed mercenaries are sent around the back way to Junin. The locals have just enough time to act on the intelligence and try to intervene. 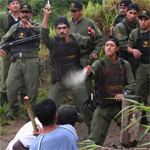 The climax is a mass arrest, carried out peacefully by the locals, of the armed paramiliataries hired by the mining company’s local affiliates. Blowing up the death star and receiving medals from the princess couldn’t feel half as good as disarming an enemy and then treating them so decently that they’re taken aback and won over to your cause. You don’t need special effects — nor even high quality video — to tell that story.